When I set out on this adventure, I was persuaded from my own research that running a diesel engine on vegetable oil would be fine, maybe a few starting problems when cold, but otherwise just as normal diesel fuel. The truth is that this is the case in part, but after 2000 miles of trials I was suffering from increased starting problems and lack of power. This was coming to a head about a week ago and I was beginning to despair for the venture as a whole. My mind was racing for solutions, such as mixing petro diesel with vegetable oil and therefore compromising much of the essence of the journey. A week ago I was having lunch with my cousins in Kent, and this anxiety came out. Then Andrew suggested that I spoke to Paul Day who they had been supporting in his business venture. Andrew described Paul as a scientist who was developing products and systems for running large-scale generators and engines on bio diesel and the like. This led to me visiting Paul at his office and workshop near Sittingbourne on my way home. As a backdrop Aquafuel have been awarded many times for their innovative and successful development of engines and power sources in both environmental and highly efficient ways. After a short meeting it soon became clear that I was heading for a serious problem, which would have probably meant the engine failing in a few thousand miles. The thing about vegetable oil is that it is much more corrosive than petro diesel and also because of its viscosity, ignition relies on the oil being hot and fluid enough as it enters the combustion chamber to fully ignite. So there are two things that needed to be dealt with. The first was the rapid deterioration of normal engine oil when using vegetable oils, almost immediately apparently there is much greater wear on the engine components as well as congealing around the piston and rings. This has been overcome by using an incredibly high quality oil that is only available, at the moment, for use in large-scale plant. This oil is so robust that Paul thinks that it will take me halfway around the world before I need to change it. He is looking into this further, and has said that he will be able to courier a supply to me when the time comes. The second problem is how to get the bike to start on a fuel successfully without it coking up the injectors in the cylinder head. - to have a dual tank, one being for regular diesel or bio diesel, which one would start the engine on and once hot, switch to vegetable. - to mix in 25% diesel fuel with the vegetable oil. Had I known this I would have had a combination of the first two solutions, all of which Paul would have helped develop scientifically. So it looks like I'm going to have to use 25% diesel fuel. This is sad but unfortunately the ticket is booked and I'm leaving in two days. 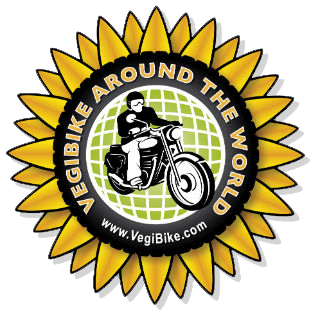 It would not have taken much to have changed it and it would have been a matter of a few hundred pounds to have made the bike almost 100% vegetable oil fueled. I might look into having a tank made with one part for vegetable oil and a much smaller compartment for bio diesel, this would save the day a great deal. I went back to Aquafuel yesterday and I spent an hour or two with David, who is an engineer working with Paul. He showed me what was involved in cleaning out the injectors, which will need to be done every 2000 miles approximately to keep it running well. I learned so much about the engine in those few hours that my confidence in this element of the journey is 10 fold by comparison to what it was before. As a further bit of most unexpected and extremely generous sponsorship, Paul has waived the charge for their very valuable time setting me up, wishing me every luck along the way. I am very very touched by this and I know Batty is loving her new oil and will run forever. It has made me think that there is a business opportunity to be had providing a solution to the problems that Paul has solved. It would involve the small unit supply of the special oil in 1 L containers, a heating element system for the vegetable oil, and possibly a dual fuel switch and tank for motorcycles. Hi Harry,it was nice meeting you the other day at the Kent Science Park. Good luck with the trip,I'll keep a close eye on your blog for updates on your progress. What port are you leaving by? If it's Dover and you're riding down through Kent i might meet you on route and ride down with you if thats ok? Ok Harry,all the best.I look forward to your first update. wow.... suprised your just learning about Veg. oil fuel use. Not very prudent of ya.. live and learn. The info you got on this day is well documented in many places. On one of your stops read thru..
that forum is a good bit of discussion on blended fuels. Preheating your engine/fuel with a propane powered heater is something to consider... you could even set up to fumigate a little lp into the cylinders on uphills... would both clean the engine AND be almost like a turbo boost on those hard climbs. Course this may be a a bit much of too much an adaptation/upgrade for someone who is already on the road. I am trying to run my L100 diesel bike on veg oil and hear lots of horror stories of ring gumming. Did you ever find a happy medium? I am really not looking for a twin tank system, to keep the complexity down, but if needs must etc. I was using 25% diesel mixed in with the veg, and that got me 16000 miles. Then I switched to a new engine and the latest ones don't like any veg oil. best try bio diesel with the new engines...let me know how you get on.